Have you ever stopped to consider the connections between large scale changes in the environment and your own health and wellbeing? It’s a daunting challenge, but it’s exactly what a group of fifth and sixth graders did this year when they helped pilot test an Introduction to Planetary Health, a new Out of Eden Learn (OOEL) special learning journey. You may not have heard the term ‘planetary health.’ We hadn’t, until a few months ago. It comes from the medical profession, and it is the name of an emerging field that brings together researchers across disciplines who are investigating the complex ways that human-influenced changes in ecosystems impact human health. Ecosystem changes are things like changing land use due to urbanization and deforestation, changing air and water quality due to pollution, and changes in the biodiversity of plants and animals due to human intervention. Human health impacts include impacts on nutrition, disease, and mental health. 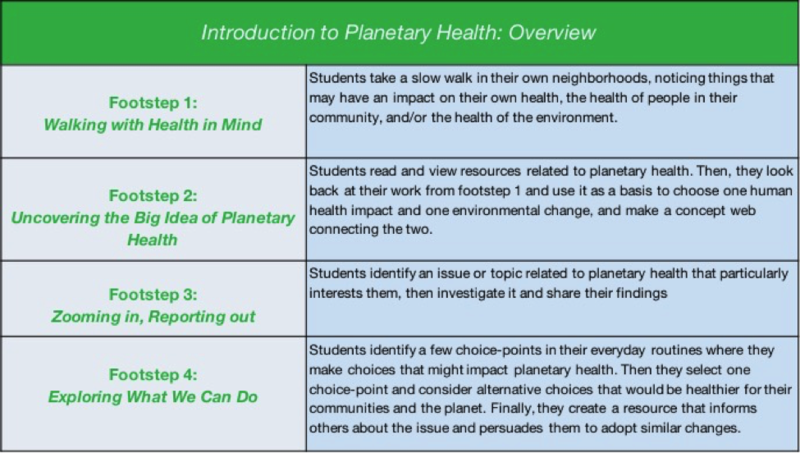 The Introduction to Planetary Health learning journey is designed to help young people explore the connections between health and environmental change by encouraging them to consider their everyday lives through a planetary health lens. There is a story behind how the OOEL team chose this topic. We have known for a while that we wanted to create a learning journey related to environmental change. It is a topic of global significance, and OOEL students and teachers frequently express an interest in it. But it is a big topic, and we’ve been pondering what angle to approach it from. An idea came from Stephen Kahn. Stephen is the director of the Abundance Foundation, which is a major funder of Out of Eden Learn. In addition to leading the foundation, he is also a physician, and he has a longstanding interest in global health. He told us that in the field of global health, a new theme was getting a lot of attention—the theme of planetary health—and he suggested we look into the work of the Planetary Heath Alliance (PHA)—a consortium of universities and organizations that have come together to advance the field. Conveniently, the Planetary Health Alliance’s headquarters is currently located at the Harvard School of Public Health—a short walk from from OOEL’s home at the Harvard Graduate School of Education. So we reached out. The Planetary Health folks graciously agreed to meet with us, and we had a great conversation. We learned a lot about the good work they do, and they helped us see that although the topic of planetary health is indeed complex, its core themes could be made accessible to young people. Much of PHA’s work to date has focused on university education, but they have recently begun to collect and disseminate resources for younger students. The PHA group resonated with OOEL’s overarching learning goals—slowing down to observe the world closely, exchanging stories and perspectives, making connections between the local and the global—and immediately saw how they connected with the topic of planetary health. The group was also excited by OOEL’s capacity to reach students around the world, and by the idea of offering a planetary health learning journey on the OOEL platform. We readily agreed to collaborate. The Planetary Health Alliance kindly loaned us a researcher named Sarah Stone, and Sarah joined a team at OOEL to develop the curriculum. In addition to Sarah, the OOEL planetary health development team included Susie Blair, Sarah Sheya, Nimah Gobir, and me, Shari Tishman. develop a sense of agency with regard to planetary health by identifying ways that their own actions and aspirations can make a difference. Here is an overview of the curriculum. The learning journey follows the standard format of all OOEL curricula. Each footstep has three parts: Get Inspired, in which students explore a variety of resources related to the footstep; a Do an Activity, in which students do an inquiry-based activity, and Interact with Your Walking Partners, in which students post their work on the OOEL online platform and comment on work posted by other students in their walking party. As the curriculum overview suggests, the learning journey is designed to be introductory and exploratory rather than comprehensive and information-heavy. The footsteps are inquiry-based: they encourage students to find things out for themselves, make their own connections, and pursue their own interests. But even with this inquiry orientation, students still need some background knowledge, and the curriculum offers several resources. For instance, there is a student-friendly overview of the topic of Planetary Health developed in collaboration with our Planetary Health Alliance colleagues. There are video instructions for each step that provide examples of student work and tips for how to complete the activity. There are links to inspirational videos, such as this video by the spoken word artist Prince Ea, and this video about the environmental dangers of microfibers. And naturally, there are resources from Paul Salopek, the journalist whose work gives the Out of Eden Learn project its name and inspiration. Paul has a deep interest in the connections between global forces and individual lives—in a sense, it’s the rationale for his Out of Eden walk across the world—and he often writes on themes that connect directly to planetary health, as in his dispatch about the effect of environmental change on the animals of Central Asia, and local efforts to change things. To pilot test the curriculum, we assembled a walking party of five 5th and 6th grade classrooms from diverse geographical locations. Our students and teachers hailed from Chennai, India; Chicago, Illinois; Danville, California; Kamuela, Hawaii; and Marblehead, Massachusetts. All of the teachers, and most of the students, had previously participated in Out of Eden Learn. We implemented the pilot between March and May of 2018, and we collected information about how things were going from three sources: We looked at the work students posted online, we analyzed the written surveys students took at the beginning and end of the learning journey, and we had regular check-ins by phone with the teachers. We were very excited to pilot the learning journey, but we also had some worries: Would students be so daunted by the complexity of the topic that they would find the activities inaccessible and frustrating? Would students be able to do the activities in a meaningful way, without much background knowledge about the science of planetary health? Would students feel so overwhelmed by the magnitude of environmental problems that they’d wind up feeling hopeless about making a difference instead of feeling inspired to make change? These are real concerns, and students certainly brushed up against them. For example, in response to a survey question about what was challenging about the learning journey, one student wrote: [It is challenging] because planetary health comes in so many forms that it’s hard to keep track of them! Another wrote: Sometimes it’s hard to understand what going on when there is a lot coming at you about the world that you didn’t know before. Yet another student said: What is hard about [planetary health] is that all the stuff we are researching is because of US!!! And that makes me feel bad, but I am going to do what I can to help!!!! These are entirely reasonable reactions to the magnitude of the topic. But we were thrilled to discover that students rose to these challenges beautifully, and even seemed energized by them. Most students said they enjoyed the learning journey, and the work they posted on the platform was overwhelmingly strong. To be sure, there was a lot of variation across students’ posts. But almost all of the student work fell well within the range we were hoping for, and we were especially pleased to see that students with diverse abilities, interests, and background knowledge were all able to participate in meaningful ways. In my life now, as a result of participating in this learning journey, I am paying more close attention to health problems around the globe. Before this journey, if I saw an example of an unhealthy environment on the news or online, I would say, “That doesn’t concern me. That place is on the other side of the world. It won’t affect me.” Now I take an interest in problems around the world and brainstorm what I can do about them. We are currently in the process of revising the curriculum, mainly by adding adding resources and tweaking instructions, and there are several additions we hope to make. Assuming our work goes well this summer, we plan to officially launch An Introduction to Planetary Health along with the other OOEL learning journeys this fall. It will be available to grades 4-12. We’ll also launch it again in the spring. If you decide to give it a try, we’d love to hear about your experience! Out of Eden Learn extends a special thank you to all of the students and educators who participated in the initial pilot of Introduction to Planetary Health.